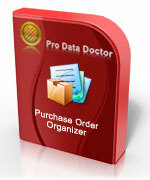 Easily create and manage sales/purchase records for your Company or Organization in real time. Facilitates users to create various sales/purchase records including quotations, delivery, invoice, receipt-deposit, client/vendor records, sales-purchase order records etc. Generates various types of sales purchase reports along with item transaction reports to view overall Business growth. User can easily search the required sales-purchase records with the help of advanced search feature. Password protected utility offers high level security by restricting external users to access the database records. Data backup and restore feature helps users to retrieve data back in exact condition if lost due to some reason. Facilitate to print records as per user’s choice and requirements.